Is it time for your trim? If so, try a New Moon Phase trim and double your hair growth. Yes you can use the energy of the new moon as it grows to increase your hair growth rate. If you have slow hair growth or stagnant growth this can solve your problem. GIVE YOUR HAIR GROWTH A BOOST!!! 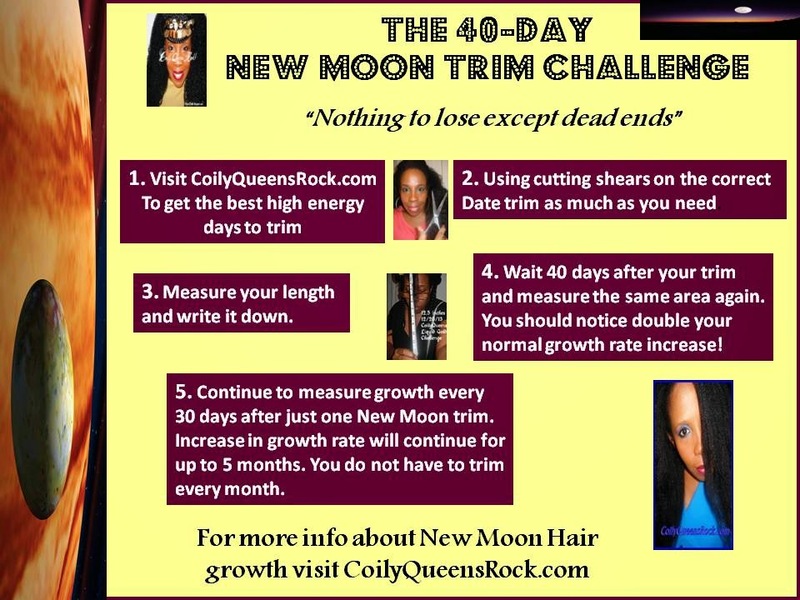 TRY A NEW MOON PHASE TRIM THIS MONTH!! SUBSCRIBE TO THIS SITE, TO KEEP UP WITH THE BEST DATES TO TRIM! How to do your New Moon Phase trim? Choose your high energy trim date. Release all your negative energy. Be sure you have trimming shears. Decide how much your will trim. Two strand twist your hair then trim off frayed ends. MEASURE YOUR HAIR AFTER YOUR TRIM. WAIT 40 DAYS THEN MEASURE YOUR AWESOME INCREASED GROWTH! MANY WOMEN RECEIVE DOUBLE THEIR NORMAL HAIR GROWTH RATE! Do you need more help reaching your hair length goals? Sign up for one on one hair growth coaching today! Yes it works for some types of hair loss. Hey Vee, thanks for all you do! Wondering when the next new Mon trim dates are. They should be up by June 3rd.